While foreign pathogens and their products have long been known to activate the innate immune system, the recent recognition of a group of endogenous molecules that serve a similar function has provided a framework for understanding the overlap between the inflammatory responses activated by pathogens and injury. These endogenous molecules, termed alarmins, are normal cell constituents that can be released into the extracellular milieu during states of cellular stress or damage and subsequently activate the immune system. One nuclear protein, High mobility group box-1 (HMGB1), has received particular attention as fulfilling the functions of an alarmin by being involved in both infectious and non-infectious inflammatory conditions. Once released, HMGB1 signals through various receptors to activate immune cells involved in the immune process. Although initial studies demonstrated HMGB1 as a late mediator of sepsis, recent findings indicate HMGB1 to have an important role in models of non-infectious inflammation, such as autoimmunity, cancer, trauma, and ischemia reperfusion injury. Furthermore, in contrast to its pro-inflammatory functions, there is evidence that HMGB1 also has restorative effects leading to tissue repair and regeneration. The complex functions of HMGB1 as an archetypical alarmin are outlined here to review our current understanding of a molecule that holds the potential for treatment in many important human conditions. Activation of the innate immune system is a necessary step in mounting an anti-microbial response to pathogens. Clinicians have long appreciated that infectious insults and tissue injury from sterile inflammatory states produce a similar inflammatory response. Recent advances in understanding the mechanisms of innate immune system activation have pointed to certain pattern recognition receptors, such as the family of Toll-like receptors, as a common pathway for immune recognition of both microbial invasion and tissue injury. By recognizing either pathogens or endogenous danger signals released upon cellular stress or damage, these pattern recognition receptors are capable of alerting the host of danger by activating the innate immune system. In this review, we will describe one such endogenous danger signal, High mobility group box-1 (HMGB1), and its role in the pathogene-sis of many disease states. Pathogens have long been known to cause both local and systemic inflammation via activation of the immune system. Classically, descriptions of immune regulation arose from the idea that immune cells can discriminate self from non-self, and activate innate immunity when there is foreign invasion. This model, which stemmed from work done in the 1960s by Burnet and Medawar, has been modified through the years to account for new discoveries in immune cell function (1,2). Although the self/nonself model is suitable in explaining immune activation and inflammation that occurs as a consequence of clinical scenarios, such as invasion by foreign pathogens or transplant rejection, it fails to account for the inflammation which occurs in settings such as trauma or autoimmunity, which are void of non-self stimuli. In an attempt to better describe these phenomena, Matzinger has proposed the concept of danger signaling (3). In this model, initiation of the inflammatory response occurs in response to molecular patterns that are associated with both pathogens and some normal cellular components that are released by damaged cells during both infectious and sterile processes (4). The concept of cellular communication by “danger signals,” whether exogenous or endogenous, reconciled the paradox of immune activation in both infection and sterile injury. In the danger model, immune activation is the result of recognition of molecular patterns by cellular receptors. Molecular elements from pathogens that elicit an immune response (i.e. lipopolysaccharide [LPS], bacterial DNA, viral RNA) are specific patterns termed Pathogen Associated Molecular Patterns (PAMPs). These PAMPs are generally invariant and it is their recognition by the immune system that triggers the inflammatory response (5,6). The cellular receptors that recognize these patterns are evolutionarily conserved and called Pattern Recognition Receptors (PRRs) (6). Inflammatory responses following sterile injury closely mimic those seen during infection, with similar cytokine and chemokine production patterns (7,8). Several endogenous molecules that are released during both infectious and sterile inflammation, such as HMGB1, heat shock proteins (HSPs), S100s, and hyaluronan, have been implicated as possessing the capacity to trigger the immune system through PRRs, much like PAMPs (9, 10, 11). These signals are normal cell constituents and are released either passively by necrotic cells or actively secreted by stressed cells in response to cellular injury. While the term PAMP is restricted to patterns located on pathogens, these endogenous analogues are termed alarmins (12). The exogenous PAMPs and endogenous alarmins are subgroups of the larger category of danger signals termed Damage Associated Molecular Patterns (DAMPs) (13,14). Alarmins are of particular interest because of their role in both infectious and sterile inflammation. They are present either locally or systemically in severe sepsis, burns, infection, arthritis, and cancer (10,15, 16, 17). Alarmins are found in a variety of organelles in all cell types studied and maintain functions in normal cellular homeostasis. They are found in the nucleus as transcription factors (HMGB1), in the cytoplasm as calcium regulators (S100s), in exosomes as chaperones (HSPs), or as components of the cell matrix (hyaluronan). Although diverse in their locations during homeostatic conditions, alarmins have many common functional characteristics. In addition to immune activation, an alarmin is released rapidly during necrosis, sequestered in apoptosis, has potential for active secretion by immune cells, and ultimately promotes homeostasis (13). Because alarmins are a diverse group of ubiquitous molecules implicated in nearly all inflammatory states, understanding and ultimately modulating their activity may allow us to control the inflammatory processes. The high mobility group (HMG) nuclear proteins were discovered in 1973 in an effort to better define the specific regulators of gene expression (18). This group of non-histone, chromatin-associated proteins has since been characterized to be involved in DNA organization and regulation of transcription. This family of proteins shares structural characteristics which make them unique from other chromosomal proteins. These characteristics include transcripts with long AT-rich 3′ untranslated regions as well as carboxy-terminal regions which are highly negatively charged (19). HMG proteins are constitutively expressed in the nucleus of eukaryotic cells. Collectively, they share functional motifs that bind specific DNA structures and induce conformational changes without specificity for target sequences. HMGB1 is a member of a subfamily of the HMG proteins. On average, HMGB1 is found at concentrations of 106 molecules per cell and non-specifically binds to the minor grooves in DNA (19). This binding is regulated by two 80 amino acid HMG-1 domains (or boxes), each structurally represented as three α-helices in a characteristic L-shaped fold (20). The nuclear localization of HMGB1 and its affinity for DNA is regulated through phosphorylation and acetylation, and has been found to have a dynamic relationship with chromatin (21). Like the other members of this protein family, HMGB1 plays an important role in DNA architecture and transcriptional regulation. HMGB1 first was implicated as an important endogenous signaling molecule in 1999 when Wang et al. described the cytokine activity of HMGB1 by identifying it as a late mediator of endotoxin-related lethality in mice (10). This study reported increased serum levels of HMGB1 from 8 to 32 h after endotoxin exposure, attenuation of lethality with delayed administration of an HMGB1 neutralizing antibody, and lethality with direct administration of HMGB1 (10). This groundbreaking work sparked renewed interest in HMGB1 as an important component of the immune response. The specific interactions and functions of the HMGB1 DNA binding domains have been described. As noted above, the structure of HMGB1 contains two separate “boxes,” the A- and B-boxes, each containing ∼80 amino acids in an L-shaped fold, along with an acidic C-terminal tail (20). These separate structural motifs appear to function differently when isolated from HMGB1. Several studies have identified the B-box domain as important for many of the proinflammatory properties of HMGB1 including cytokine release (22,23). In comparison, the A-box does not possess the pro-inflammatory properties of the B-box and instead competes with HMGB1 for binding sites leading to attenuation of the inflammatory cascade (24). HMGB1 is released passively during cellular necrosis by almost all cells which have a nucleus and signals neighboring cells of ongoing damage (25). However, HMGB1 also is secreted actively by immune cells such as monocytes, macrophages, and dendritic cells (10,16,26). Active secretion of HMGB1 is generally through non-traditional, leaderless pathways which are not routed through the endoplasmic reticulum or Golgi apparatus, similar to IL-1 (27). During normal cellular homeostasis the dynamic relationship of HMGB1 with the nucleus and cytoplasm heavily favors the nucleus. However, HMGB1 localizes in secretory lysosomes when hyper-acetylated on lysine residues and then is released upon appropriate signaling stimuli (21,28). When HMGB1 is not acetylated, it remains localized to the nucleus and is not secreted or released, such as during apoptosis (25). How the acetylation of HMGB1 is regulated is yet to be determined but is surmised to involve deacetylases in the nucleus (16,21,29). In other studies, specifically with TNFα stimulated macrophages, the secretion of HMGB1 is dependent upon phosphorylation (30). While these modifications are clearly important in the release of HMGB1, it currently is unclear how these specific modifications differ. Stimuli for secretion of HMGB1 from immune cells are diverse and include PAMPs, cytokines, and certain states of cellular stress. Macrophages release HMGB1 starting approximately 8 h following exposure to LPS (10,31, 32, 33) but do not demonstrate the same response to CpG DNA (34). It is notable that release due to LPS is dependent, at least partially, on TNFα (31). HMGB1 also can be released in response to polyinosinic-polycytidylic acid (a model of viral infection) (33,35), while in vitro viral stimulation has demonstrated only passive release of HMGB1 due to cytokines or necrotic cells (36). In addition to these PAMPs that result in the release of HMGB1, endogenous molecules such as cytokines released during other states of injury can result in secretion of HMGB1. While first demonstrated with IFNγ, macrophages also release HMGB1 in response to stimulation with TNFα, IL-1, and oxidative stress (35,37, 38, 39, 40). Interestingly, the PAMPs and cytokine stimuli for HMGB1 secretion from macrophages occurs through distinct pathways (35). For example, while LPS regulates HMGB1 release by hyper-acetylation, TNFα-induced secretion is mediated through phosphorylation, which directs it to the cytoplasm for release (30). While it was thought initially that HMGB1 was released only from cells of the immune system, other cells have since been demonstrated to actively secrete alarmins. The first non-immune cell to be studied for active HMGB1 secretion was the pituicyte, which was found to release HMGB1 in response to IL-1 or TNFα stimulation (41). Enterocytes release HMGB1 following stimulation with a cytokine mixture (42). Hepatocytes also can release HMGB1 in response to hypoxic conditions or oxidative stress; this release appears to be mediated by calcium signaling changes within the cell (43). The inhibition of HMGB1 also has been an important topic for those seeking to ameliorate injury by decreasing the level of HMGB1 release. A variety of pharmacologic agents have been studied for their potential to inhibit release of HMGB1; however, a full discussion of pharmacologic inhibition of HMGB1 is beyond the scope of this paper. It is worth noting, though, that HSP72, an endogenous molecule that has itself been indicted as an alarmin, has been demonstrated to inhibit HMGB1 release. Originally, it was demonstrated that brief heat shock resulted in decreased HMGB1 release from LPS-stimulated macrophages, but no specific pathway was identified (32). Recently, HSP72 overexpression has been shown to inhibit HMGB1 release from macrophages in response to LPS, TNFα, or oxidative stress (hydrogen peroxide). This inhibition appears to be due to intranuclear interactions between HSP72 and HMGB1 (44,45). As noted above, PRRs are a group of molecules that recognize the molecular patterns of DAMPs. These receptors may be activated by PAMPs, alarmins, or both, to activate the immune system. Several important receptors have been implicated in HMGB1 signaling, including the receptor for advanced glycation end products (RAGE) and members of the Toll-like family of receptors (TLRs). RAGE is a transmembrane protein expressed at low levels in normal tissues that is upregulated at sites where its ligands accumulate (46). The receptor first was identified to bind advanced glycation end products in diabetes, but has since been identified to bind other ligands and is involved in multiple inflammatory states (46,47). RAGE was also the first receptor demonstrated to bind HMGB1 (48). At the time, the consequences of HMGB1 interaction with RAGE were unknown, but it was discovered later that HMGB-1 signaling through RAGE promotes chemotaxis and the production of cytokines in a process that involves the activation of the transcription factor nuclear factor-κB (NF-κB) (49,50). Other RAGE-dependent effects of HMGB1 appear to involve the maturation (23,51, 52, 53) and migration (38,53, 54, 55, 56) of immune cells as well as the upregulation of cell surface receptors (57, 58, 59). In addition to RAGE, the Toll-like family of receptors has been demonstrated to be important in HMGB1 signaling. Members of the TLR family share many structural similarities, both extracellularly and intracellularly, but they differ from each other in ligand specificity, expression patterns, and, in some instances, the signaling pathways they activate. Generally, TLRs can recognize both DAMPs and PAMPs and hence are involved in immune response to both infection and injury. Members of the Toll family have specific ligands, and TLR4 might be the most well known and for its role in the bacterial endotoxin (LPS) recognition complex (60). TLR4, TLR2, and TLR9 have all been implicated as HMGB1 receptors. HMGB1 binding of TLR2 and TLR4 results in NF-κB upregulation (61, 62, 63), thus making it likely that HMGB1 stimulation of these receptors can lead to cytokine release. Interestingly, HMGB1-mediated TLR4 activation is different from that resulting from LPS stimulation (50,62). For example, when applied to cell cultures, HMGB1 activates both IKKα and IKKβ, whereas LPS only activates IKKβ. Additionally, the MAPK protein activation and cytokine production profiles differ between HMGB1- and LPS-treated cells. There is much speculation that HMGB1 does not act alone in the triggering of receptor activation. Proof of this concept was provided by Tian et al. who demonstrated that HMGB1-DNA complexes activate TLR9 signaling (64). HMGB1 involvement in TLR9 activation appears to be mediated by HMGB1-DNA complexes rather than HMGB1 alone. While HMGB1-DNA complex stimulation of TLR9 is involved in maturation of immune cells and cytokine secretion (64,65), there is some evidence that these complexes may also suppress the immune response in some cell types (66). In addition to the HMGB1-DNA interactions that activate TLR9, HMGB1 interactions with other cytokines such as IL-1β, IFNγ, and TNFα lead to an increased pro-inflammatory response compared with HMGB1 stimulation alone (67). Ultimately, whether other interactions or modifications of HMGB1 are required for pattern recognition receptor binding or activation is uncertain. As HMGB1 has multiple downstream signaling responses due to activation of different receptors, it also induces cell specific responses when it stimulates cells of the immune system (Figure 1). HMGB1 induces DC maturation as measured by the increased expression of many cell surface markers as well as the secretion of inflammatory cytokines (23,51, 52, 53). Monocytes stimulated with HMGB1 have an increased capacity for adhesion (38) and release numerous cytokines and inflammatory mediators (61,68, 69, 70). This effect is augmented when administered concomitantly with other cytokines (67,71). Neutrophil stimulation with HMGB1 increases the interaction of MAC-1 and RAGE, thus activating the adhesive and migratory function of these cells (56). Furthermore, HMGB1 stimulates the production of reactive oxygen species by neutrophils through a TLR4 dependent activation of NAD(P)H oxidase (72), as well as increases the activation of NF-κB which results in increased production and release of cytokines (50,62). T cells stimulated with HMGB1 release cytokines and appear to have increased proliferation, survival, and Th1 functional polarization (23,51). HMGB1 is an endogenous nuclear protein that is released due to a variety of stimuli to activate proinflammatory responses in multiple cell types. The response of endothelial cells to exogenous HMGB1 has been studied in relation to its possible pro-inflammatory role in vascular disease. Endothelial cells release TNFα, IL-8, and MCP-1, all of which enhance the local inflammatory environment (57,58). Additionally, HMGB1 stimulation appears to increase the expression of ICAM-1 and VCAM-1 on the surface of endothelial cells, thus increasing the adhesion of inflammatory cells (57,58). These effects appear to be at least partially mediated by RAGE, which also appears to be upregulated in HMGB1-stimulated endothelial cells (57,58). In contrast to their role in promoting inflammation, the ability of alarmins to promote tissue repair and regeneration is of increasing interest (73). Importantly, HMGB1 induces migration of stem cells toward inflamed regions to promote repair and regeneration (74). Furthermore, it results in increased mesangioblast and endothelial proliferation and migration to sites of inflammation and induces transit of these cells across the endothelial layer (75,76). Myoblasts stimulated by HMGB1 migrate toward damaged regions and stimulate repair (77,78). These effects on specific cell types are reflected in increased regeneration at the tissue level. In smooth muscle, HMGB1 induces proliferation and rapid changes in cellular architecture leading to cell migration (79,80). In skeletal muscle, HMGB1 promotes increased myogenesis and angiogenesis (49,76,77). Further confirmation of this is reflected in the finding that inhibition of HMGB1 signaling leads to decreased vessel density and tissue regeneration (77). Additionally, direct injection of exogenous HMGB1 to peri-infarcted car-diomyocytes in mice results in increased myocytes within the infarcted area and ultimately improved outcomes by both structural and functional measures (81). In an animal model of wound healing, topically applied HMGB1 accelerates the process in diabetic mice while inhibition of HMGB1 signaling slows it in normal mice, thus implicating functional HMGB1 signaling as an important component of diabetic wound healing (82). The ability of HMGB1 to stimulate angiogenesis has been demonstrated independently in studies demonstrating that exogenous HMGB1 stimulates endothelial proliferation and migration (75,83). Interestingly, many of these restorative effects are mediated through the same receptors (i.e. RAGE) that mediate the pro-inflammatory properties of the molecule (75,77, 78, 79,84). Taken together, the regenerative properties of HMGB1 represent a potentially important manner by which the functions of an alarmin can be manipulated to promote healing as opposed to injury. While early work on HMGB1 demonstrated its role as a late mediator of sepsis (10), more recently HMGB1 has been implicated as a putative danger signal involved in the pathogenesis of a variety of non-infectious inflammatory conditions including autoimmunity, cancer, trauma, and hemorrhagic shock, and ischemia-reperfusion injury. Furthermore, it has been studied in a number of organ systems including liver, heart, pancreas, brain, bone, and kidney. 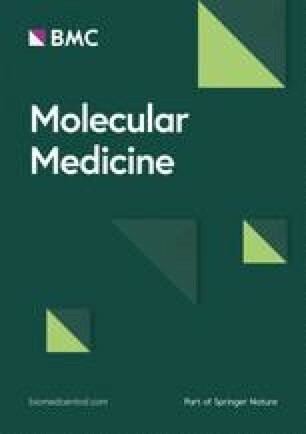 In addition to these studies highlighting the pro-inflammatory effects of HMGB1 in in vivo models of multiple diseases, there is emerging evidence to suggest that HMGB-1 can participate in tissue repair and remodeling as well as preconditioning; all of which are increasingly being recognized as important capacities of danger signals. Considerable evidence exists implicating extracellular HMGB1 in the pathogenesis of a variety of autoimmune diseases. Anti-HMGB1 antibodies are present in the serum of patients with rheumatoid arthritis and drug-induced systemic lupus erythematosus (85,86). Furthermore, HMGB1 has been found to be overexpressed in the extracellular milieu of synovial biopsy specimens in rheumatoid and experimental arthritis (87,88). When given via direct intra-articular injection, HMGB1 induces arthritis in mice, while treatment with HMGB1 antagonists ameliorates collagen-induced arthritis in both rats and mice (89,90). Increased extracellular HMGB1 also is detectable in the dermis and epidermis of skin lesions in patients with cutaneous lupus erythematosus and in biopsy specimens of the minor salivary glands of patients with Sjogren’s Syndrome (91,92). HMGB1 was initially identified as a nuclear DNA-binding protein. As such, it plays a role in the transcription of several genes, some of which include those that have been implicated in cancer development including E-selectin, TNFα, insulin receptor, and BRCA (93, 94, 95, 96). Furthermore, cancer cells that have undergone necrotic cell death can release HMGB1 into the local microenvironment. 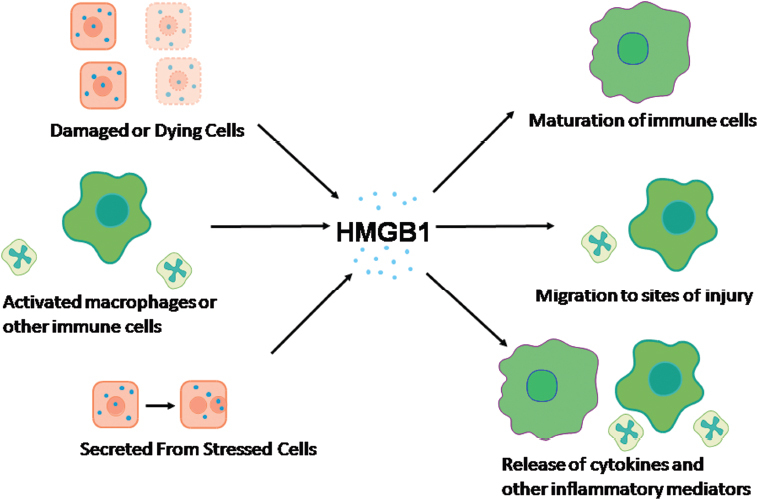 Extracellular HMGB1 can lead to chronic inflammatory/reparative responses that, in the setting of cancer, may lead to tumor cell survival, expansion, and metastases (97). Interestingly, numerous studies suggest that HMGB-1 plays a role in metastasis development, and thus links it to poor prognosis in a variety of cancers including prostate, breast, pancreas, and colon (98, 99, 100, 101, 102, 103, 104, 105, 106). In contrast to its potential role in tumor growth and spread, it also has been shown that HMGB1-induced TLR4 signaling is required for effective responses to chemo-radiation in established tumors in animal models (107). These findings are validated further by the observation that node positive breast cancer patients carrying a loss of function TLR4 allele tend to relapse more quickly after treatment with chemo-radiation as compared to patients with wild-type TLR4 alleles (107,108). More recently, HMGB1 has been recognized as a tumor derived DAMP capable of recruiting and activating eosinophils. The role of tumor infiltrating eosinophils is still being elucidated as they can either limit tumor growth through destructive effector functions or promote tumor growth through immunoregulation and tissue repair/remodeling (109,110). In addition to the evidence linking HMGB1 to established cancers, it has also been linked to the pathogenesis of premalignant conditions. Elevated serum levels of HMGB1 are present in mice with chemically induced colitis. Furthermore, neutralizing antibodies to HMGB1 decrease tumor incidence and size in colitis-associated cancer models (111). The sum of these findings suggests that HMGB1 plays a role in tumor development, growth, and spread. Additionally, immune responses to established cancers prior to, as well as during, systemic treatment appear dependent upon HMGB1/TLR-4 mediated signaling cascades. Consequently, HMGB1 warrants further investigation as a possible therapeutic target in malignant processes. End organ dysfunction in trauma and hemorrhagic shock results from systemic inflammatory responses (112). Barsness et al. provided indirect evidence that HMGB1 may be involved in the pathogenesis of end organ injury following hemorrhagic shock by linking TLR4 activation to the development of acute lung injury (113). Subsequently, it has been shown that pulmonary HMGB1 levels are increased as early as 4 h after the initiation of hemorrhagic shock (114). Furthermore, HMGB1 neutralizing antibodies ameliorate hemorrhage-induced acute lung injury (114) as well as gut barrier dysfunction and ultimately lead to improved survival (115). These findings are even more relevant given the clinical observation that circulating HMGB1 levels are elevated in trauma patients with hemorrhagic shock as compared with normal volunteers (115). Additionally, HMGB1 has been shown to play a central role in the initiation and propagation of the inflammatory response following traumatic injury. In a mouse femur fracture model, administration of neutralizing HMGB1 antibodies results in decreased serum IL-6 and IL-10 levels. This blunted systemic response corresponds with decreased hepatic and gut barrier dysfunction as measured by serum transaminase levels and NF-κB activation, respectively. Interestingly, the contribution of HMGB1 to end organ injury in this model appears once again to be TLR4 dependent, as mutants are protected when compared with wild-types. No additional protection is seen when antibodies are administered to TLR4 mutants (116). The role of HMGB1 in the pathogenesis of acute or chronic viral illnesses remains elusive. As mentioned, HMGB1 can escape extracellularly upon necrotic cell death. West Nile encephalitis and acute hepatitis are viral-induced pathologies associated with necrotic cell death either via direct cytotoxic effects of the virus itself or the inflammatory response to viral infection (36). In a recent study utilizing hepatitis B virus (HBV) transgenic mice injected with virus specific cytotoxic T lymphocytes (CTLs), HMGB1 translocates from the nucleus to the cytoplasm of hepatocytes surrounding CTL-containing necroinflammatory foci. Furthermore, treatment with HMGB1 inhibitors in this model significantly decreases the recruitment of inflammatory cells (117). In addition to passive release from necrotic cells, HMGB1 can be secreted actively by inflammatory cells (monocytes, macrophages, dendritic cells, etc.). A number of viral illnesses including SARS and influenza result in the elevation of proinflammatory cytokines (TNF, IL-1, IL-6, types I and II interferon) that could be responsible for inducing release of HMGB1 from inflammatory cells, thus leading to the propagation of the immune response (36). A preponderance of evidence exists implicating HMGB1 in the pathogenesis of ischemia/reperfusion injury (IRI) in multiple organ systems including kidney, brain, heart, and liver. Much of the seminal work identifying extracellular HMGB1 as an alarmin that initiates the inflammatory response resulting from IRI was performed using a model of partial warm hepatic IRI in mice. In this model, tissue levels of HMGB1 are elevated as early as 1 h following reperfusion (118) and continue to increase for up to 24 h following the insult. Furthermore, in this same model, neutralizing antibodies to HMGB1 ameliorate the damage resulting from IRI in a TLR4-dependent manner. The importance of HMGB1 signaling through TLR4 in hepatic IRI was further clarified in subsequent in vivo experiments by the generation of chimeric mice in which TLR4-derived bone marrow cells were shown to be largely responsible for the initiation and propagation of the inflammatory response. In this set of experiments, mice expressing TLR4 mutant bone marrow-derived cells were protected from liver damage as compared to those expressing TLR4 wild type bone marrow-derived cells. This occurred independently of the TLR4 phenotype expressed on hepatocytes (119). Subsequently, it was shown that increasing the number of hepatic dendritic cells worsened liver damage in TLR4 wildtype but not TLR4 mutant animals (59), thus suggesting that dendritic cells are involved in the recognition of and response to DAMPs (HMGB1 included) released after acute injury in this model. The molecular mechanisms of HMGB1/ TLR4-dependent IRI involve the production of reactive oxygen species in a process that appears to be dependent on calcium signaling via the calcium/ calmodulin-dependent kinases (CaMK) whose activation is ultimately involved in the release of HMGB1 (43). While the significant body of literature described above elucidates the role of HMGB1 in hepatic IRI, similar work in other organ systems including the heart (120,121), kidney (122), and brain (123, 124, 125) has provided confirmatory evidence that HMGB1 is involved in the initiation of the inflammatory response following IRI. A well characterized effect of pathogen-associated molecular patterns (PAMPs), such as LPS, is their ability to confer protection when administered in small doses prior to more significant insults in a process that has come to be known known as preconditioning. Therefore, alarmins ought to be able to precondition against later insults as well. Proof of principle of this concept has been demonstrated by HMGB1’s ability to provide protection when administered as a precondition agent in hepatic IRI (126). HMGB1 administration 1 h prior to the onset of injury results in a dose-dependent protection as evidenced by decreased circulating biochemical markers of liver damage as well as decreased serum TNFα and IL-6 levels. This preconditioning effect appears to be mediated through an inhibition of TLR4 signaling (126). There is a growing body of literature surrounding the specific functions of HMGB1 on cells of the immune system as well as its role in important disease states. As the mechanisms promoting the release of HMGB1 and the signaling pathways it activates remain to be completely elucidated, evidence that suggests its potential as a therapeutic target/agent in various models of inflammation continues to accumulate. Importantly, human-subject studies which demonstrate its elevation in several disease states further indicate its importance. Interestingly, in addition to its pro-inflammatory roles, HMGB1 also appears to have several regenerative effects that lead to tissue repair. Understanding HMGB1 and its complex effects on the immune system may lead to the development of novel strategies to attenuate inflammation and/or promote tissue repair and regeneration in various clinical states.